4" round 8-diode tail light. Sonically sealed lens and housing. Offers stop, turn and tail light functions. 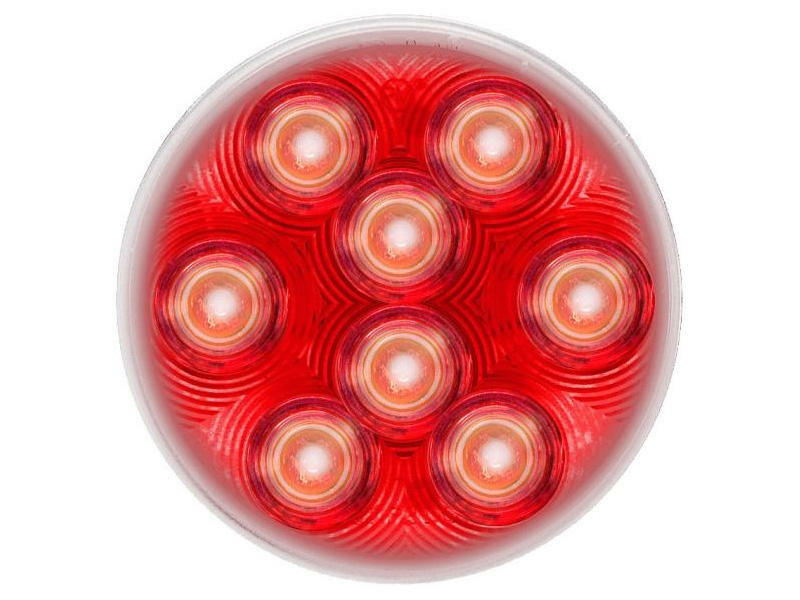 This version of light features red diodes behind a clear lens. The molded pigtail is included; the rubber grommet is not. Potted circuitry- impervious to moisture! Peterson officially opened its doors in 1945 as a small company specializing in manufacturing safety lighting for the automotive aftermarket. Over the past 60 years, Peterson has become an industry leader and introduced a host of innovations including stainless steel housings that won't rust, the Vibar® socket and Piranha® Light Emitting Diodes (LEDs). Through the years, Peterson has grown from a small, family business to a multi-industry corporation. During this transformation, leadership continually focused on creating the highest quality product possible. This core value is perhaps best reflected in the fact that Peterson was one of the first 40 manufacturers in the entire United States to obtain ISO 9001/QS-9000 registration. Specifically, Peterson was the very first US vehicle safety lighting manufacturer to obtain this important registration that lets customers know that our quality systems meet a standard of excellence that is internationally understood and accepted. Quality is also why Peterson builds products that not only meet federal specifications, but also exceed them by 25% and why we boast the industry's lowest return rate on a line of over 2,000 products.